In the shadow of the recent Olympics it might sound anticlimactic to say that I’m extremely proud to be Ontarian because of the Energy Apps for Ontario Challenge, but the competition—and the greater Green Button initiative—is a vital part of empowering consumers to understand and manage their energy consumption. The Apps Challenge is a great example of how MaRS and the Ontario government support the innovative ideas of entrepreneurs who are tackling society’s emerging challenges. With over $50,000 in awards from the Ministry of Energy, we’ve encouraged the creation of great solutions to engage electricity consumers. After the launch of the challenge on October 1, 2013, developers had until January 21, 2014, to develop their applications. Public voting and judging took place between February 3 and 17. A variety of free resources were available to developers throughout the challenge, including access to a free test lab sponsored by Affinity Systems that allowed developers to test their apps and ensure that they worked with the Green Button Connect My Data API. Judges were looking for creativity and originality, quality of execution, and the potential of the apps to impact how consumers make decisions regarding their electricity use. It was over a year ago that MaRS partnered with the Ministry of Energy to launch the Ontario Green Button initiative. Since then, 60% of residential consumers have gained access to their electricity data and we continue to forge ahead, with the most recent milestone being the Energy Apps for Ontario Challenge. Here is a brief look at what’s been accomplished over the past 18 months. September 2012: MaRS launched a peer-to-peer group to solicit input from entrepreneurs. November 2012: The Ontario Green Button initiative was launched and a working group was established. February 2013: Green Button Download My Data standards were developed and utilities began implementing them. Currently, Festival Hydro, Guelph Hydro, Hydro One, London Hydro, North Bay Hydro, Ottawa Hydro, PowerStream and Toronto Hydro provide access to their customers. September 2013: The MaRS Energy Hackathon took place, with 100 developers, London Hydro, Energent, Affinity Systems and a number of partner sponsors. October 2013: The Energy Apps for Ontario Challenge was launched. November 2013: Connect my Data pilots were announced. December 2013: Over 2.85 million consumers now have access to Green Button Download My Data. February 2014: The Energy Apps for Ontario Challenge judging and announcement took place (see list of winners below). One result of the MaRS Energy Hackathon was the emergence of PowerInform, an innovative company that provided a second test lab for the Energy Apps for Ontario Challenge, allowing entrepreneurs to evaluate their use of the Green Button Connect my Data API. So, who were the winners of the App Challenge? The Gold Award and $20,000 goes to Wattson. The Silver Award and $10,000 goes to Beckon. The Bronze Award and $7,500 goes to Energy Tipper. The Best Student App Award and $5,000 goes to Wattermelon. The Best App Created Outside of Ontario Award and $5,000 goes to UnPlug Stuff. The People’s Choice Award and $2,500 goes to Wattson. 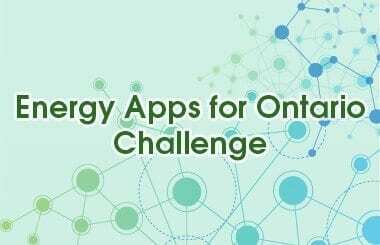 The conclusion of the Energy Apps for Ontario Challenge is closely followed by the start of the first phase of year-long Connect my Data pilots with London Hydro and Hydro One. The first phase will incorporate existing solutions, including Energent, Zerofootprint, Eyedro and BuiltSpace. In the second phase, new solutions — including winning apps in the challenge — will be considered for participation. MaRS Cleantech looks forward to continuing our support of PowerInform and engaging with Apps Challenge developers to help commercialize their products and build successful Ontario businesses.